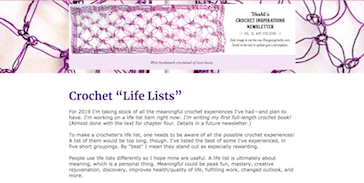 Here is the full downloadable PDF version of the crochet life lists in issue #97 of my Crochet Inspirations Newsletter. There were seven short life lists by topic in that issue. First page of the five-page Crochet Life Lists PDF. The seven topics are preserved and expanded a bit in the PDF. I also had more room for adding checkboxes, and blank lines so that you can customize them. The last two pages of the PDF (it’s five pages in all) list additional items to give you ideas for what to add to your lists. Curious what are on my own crochet life lists? Look for the red boxes on those last two pages!